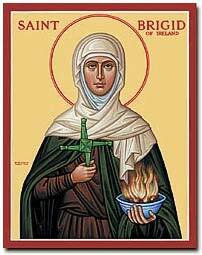 Today is the feast day of St. Brigid of Kildare. The people of Ireland love her dearly, as do the people who love the people of Ireland (folks like me). The legends about Brigid far outweigh the facts known about her. She was born around 450. Her parents may have been baptized by St. Patrick. We know she founded a Christian community at Kildare, primarily for women. She had a profound influence on the Church in Ireland. She may have been consecrated as a bishop. (Thus, she is often depicted with a bishop’s crozier.) When others protested that he improperly bestowed this Holy Order on a woman, Bishop Mel reportedly replied “No power have I in this matter.” He suggested that God alone had chosen Brigid for that Holy Office. Brigid understood that the physical needs of the poor intersected with their spiritual needs. We remember Brigid for her profound hospitality, her unflinching generosity, and her extraordinary compassion. I pray that her spirit will grow within the Church today, which so desperately needs it. I found this prayer for today within the wonderful Celtic Book of Daily prayer. I hope you find as much life and joy and light in it as I do. This entry was posted in Uncategorized and tagged Anglican, Bible, Disciple, Celtic Christianity, Charity, Christianity, Compassion, Dominican, Episcopalian, Generosity, Hospitality, Ireland, Religion, Saints, Spirituality, St. Brigid of Ireland, St. Brigid of Kildare. Bookmark the permalink. What a beautiful description of what we as Christians are called to in that simple prayer. If we, as the Church, would follow, what a world this would be. Thanks for sharing, Br. James. “If we, as the Church, would follow, what a world this would be.” I can’t think of thing in the world that’s stopping us. My brother Aquinas said that we love because we are first loved. By corollary, I think we are blessed because we have first been blessed. Thank you for the blessing of your friendship. Greetings brother James. I’m a big fan of history. The saints in their day saw life, God and mission from another perspective which to me is both challenging and fascanating. Thanks too for visiting my blog on Image breakers today. I think you’re exactly right. I love Church history, and love to study the lives of the saints of the Church. Good luck with your blog, and I look forward to reading much more. You are always so kind and offer a deeply generous spirit. This was very beautiful. Thank you for sharing such a special poem. It captures such spirit of Purity of Heart. From when I was young, I was taught to live as if Christ may “Enter the Home” at any moment and to live in “readiness”. I see the the Spirit is in the Faces of each as well as in the One. It is a teaching that keeps growing in depth. I think living in readiness is precisely the way we’re called to live. I love the poem as well. On this Eve of Candlemas (or the Feast of the Presentation), I’m reminded of one of the legends of Brigid. In a narrative suspension of almost 500 years of time as we think of it, Brigid is recalled as a friend of the Virgin Mary (Mary’s midwife in fact) and foster mother to Jesus. One of the associated legends gives us the beautiful story of Brigid leading a shy Mary into the Temple with candles in her hands. And so, we have Brigid’s day leading us into the holy day of The Presentation of Our Lord. A lovely couple of days for us to remember the deep significance of women in shaping our faith and our stories. Thanks so much for this. While there are a number of stories of Brigid that stretch our imaginations, I think the reason is that no factual account does justice to our experience of the Holy. Yes, Teresa, I’ve loved it for a long time. O, that my conversations with God would be less about me! Thanks for your post. I love that prayer, Katie! I’m sorry you’ve been under the weather, but at least you were able to squeeze a good post out of it. Hope you’re feeling better soon. It is a precious thing to be a daughter of God, and I enjoyed this historical and inspirational story. I think you’re precisely right. It’s a very precious thing indeed. Yes, the prayer is wonderful. One of my brothers suggested that it should grace every home. Or at least every heart. I apologize for being so late in telling you how glad I am that you’re back, Brother. May St. Brigid bless us both. I’m not sure how regularly I’ll be back, but I try and post now and then. Be blessed, my friend, and be a blessing.